Nathan Fake made his debut in '03 on James Holden's Border Community label. What some have described as Boards Of Canada do Techno, Fake has been pushing his sound to it's limits in recent years. Fake recenty supported Four Tet on Hebden's North American "There Is Love In You" tour and where I caught him in Los Angeles. In a must see live show, Fake tirelessly fights with his equipment, elements torn apart and forced back together with no mercy. Distorted, aggresive, pounding beats and dancefloor welcome, there's no way to ignore his presence on stage. His sophmore release, "Hard Island" was released last year on Border Community. Recently, Fake has been on his remix game, re-shaping recent works from PVT (formerly Pivot), Jon Hopkins and Walls. 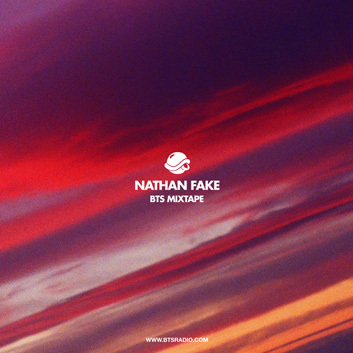 Recorded exclusively for BTS, Fake creates a true mixtape in beautiful lo-fi, covering a spectrum of his personal listening, from ambient, psychedelic, rock to electronic. Nathan Fake writes, "This mix was recorded straight to C90 cassette, I wanted to make it like a mixtape for a mate or something so that's why it's pretty messy and stuff. It's two separate MP3s, Side A and Side B obviously, so you have to virtually turn the tape over when the side's done. Might seem a bit pointless but I thought it'd be a fun way to record a mix."